After registering a minor growth of 1.9% in April 2015 automobile domestics sales declined very marginally by 0.58% in May 2015 according to the Society of Indian Automobile Manufacturers (SIAM) released figures. However, passenger and commercial vehicles continued their growth, with Medium & High Commercial Vehicles (M&HCVs) growing by 24.40%. While automobiles production also declined by 1.35% while exports were up by a nominal 3.99%. The Passenger Vehicles sales grew a moderate 4.67% in May 2015 compared to the same period in 2014. Among the group, all segments but passenger cars declined, which grew by 7.73%. 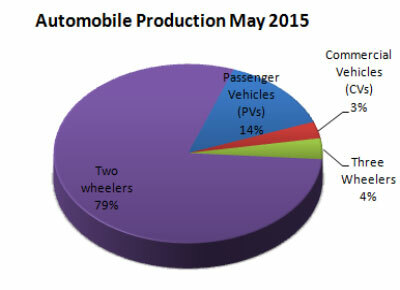 The Utility Vehicles segment declined by 2.27% while Vans domestic sales were down by 5.06%. Commercial Vehicles grew at 3.95%, with the Medium & High Commercial Vehicles (M&HCVs) sub-segment continuing its impressive growth at 24.40% with passenger carriers sub-segment growing impressively by 29.69% while the goods carriers growing by 23.09%. Light Commercial Vehicles (LCVs) segment also registered growth of 3.95%, with the passenger carriers growing by just 0.94% while goods carriers continuing their decline at 8.67%. 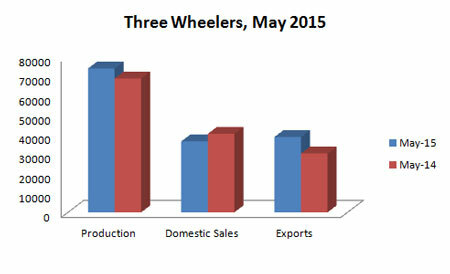 The decline in Three Wheelers segment was 9.71% in May 2015, larger than the decline of 2.33% in April 2015. Passenger Carriers and Goods Carriers both declined by 11.57% and 1.39% respectively. 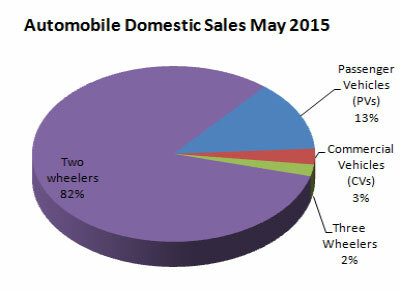 The Two Wheelers segment also declined slightly by 1.25% in May 2015. While Scooters and Mopeds sales grew positively by 2.61% and 5.30% respectively, sales of Motorcycles declined by 3.04%. Automobile exports in May 2015 were up by 3.99% over May 2014. 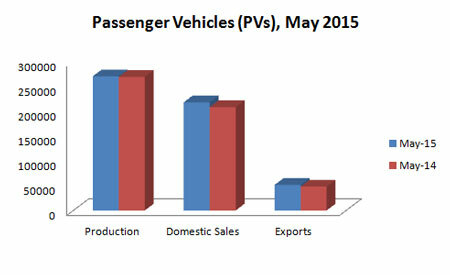 Passenger vehicles registered 20.87% higher exports in May 2015. Passenger vehicles exports rose by 7.36%, with exports of vans grew a whopping 530.51% while passenger cars exports grew by 8.23% and utility vehicles exports declined by 3.16%. 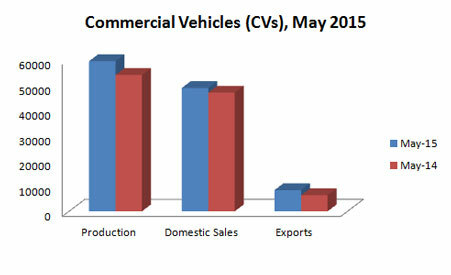 Commercial vehicles exports grew a good 32.48%, with M&HCVs growing by a 14.29% and LCVs exports rising by 42.90%. 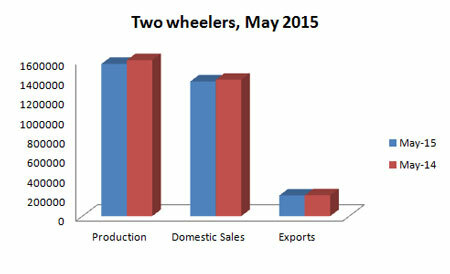 Export of three wheelers up by 27.93% but in two wheelers, exports declined slightly by 1.01%.